Experience one month of daily Bible verses chosen to energize your prayers, strengthen your faith, and open your heart to God’s presence in your life. How can you find the time in today’s busy world, with all of the competing demands on your time, for God? You can find time by starting each morning spending a few moments with the Bible. Waking up with God’s Word will change your entire day—and over time, it will change your entire life for the better. Each day, you will have a new verse from Scripture along with a short reading that applies this biblical teaching to everyday life. And after every reading, you’ll receive a “faith step” that gives you an easy-to-follow way to bring the true meaning of God’s word into your day. Each and every moment, God asks you to make a choice. How can you be certain to choose life and blessing? In this FREE eBook, Mornings with Jesus: 31 Daily Devotions to Bring You Closer to Christ, you’ll be inspired to find gratitude and kindness in every moment. You’ll receive God’s loving guidance each day. Experience each day as the gift from God that it is. 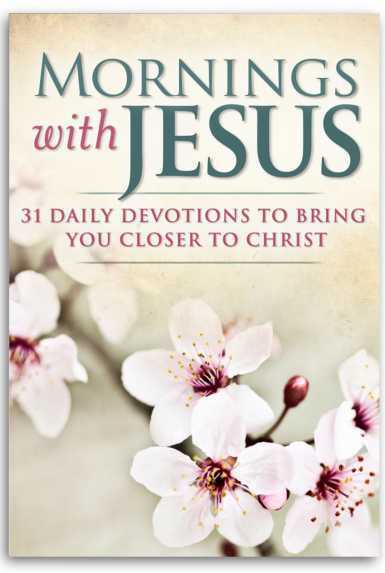 Download your Free eBook, Mornings with Jesus: 31 Daily Devotions to Bring You Closer to Christ, now.